Eligibility for Company Sacretatry of Public Listed Company. Entitlement for qualification pay etc to PIPFA Public sector qualified. On quaifing final level, one may apply for the managemnet level jobs. 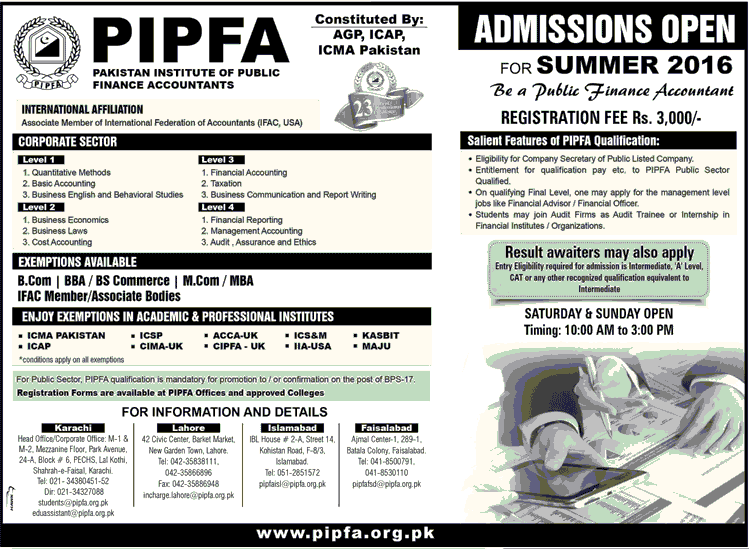 Student may join AUDIT Firms as Audit Trainee or internship in Financial Institute / Organizations. Item Reviewed: PIPFA Admissions Online 2016 Pakistan Institue of Public Finance Accountant by AGP, ICAP, ICMA 9 out of 10 based on 10 ratings. 9 user reviews.